Erwin Leykauf was born on 22 January 1918 at Germersheim. After he learned to fly at the glider school in Hesselberg, Leykauf joined the Luftkriegsschule in Dresden, studying there during 1936-37. Afterwards, he went for additional flight training at the Luftkriegsschule at Berlin-Gatow. In 1938, of his own accord, Leykauf quit the Luftkriegsschule, which was tantamount to refusing war service in the Werhmacht, to begin studies in aerodynamics and aircraft engineering at the Technische Hochschule in Munich. At the outbreak of World War 2, Fahnenjunker Leykauf was mobilized and reported to Illesheim in Franconia. In May 1940, he was transfered to JG 21. Leykauf made his first victory claim with 2./JG 21 during his time based in France when he shot down Gloster Gladiator bi-plane fighter on 10 May. On 6 June, I./JG 21 was redesignated III./JG 54 and Leykauf was assigned to its 7th Staffel. He recorded four confirmed victories during the Battle of Britain. After JG 54 was rotated out of the Channel area for rest and refit, he flew a number of missions in support of the Balkan invasion during the spring of 1941. During Operation Barbarossa, the invasion of Russia, Leykauf shot down a Russian SB-2 twin-engine bomber on 6 July 1941. The rear gunner of the bomber continued shooting at Leykauf’s Bf 109 F-2 (W.Nr. 6788) “Black 3 + ~” and hit the radiator. Leykauf performed an emergency landing behind enemy lines near Ostrow. After many adventures, crossing swamps by day and walking by night, he managed to rejoin his unit. Later the aircraft was recovered by advancing German ground forces. In October 1941, Leykauf became the Adjutant to the Gruppenkommandeur of III./JG 54, Hauptmann Reinhard “Seppl” Seiler (109 victories, RK-EL). During this time Leykauf flew many low-level attacks over the Wolchow area. On 30 March 1942, Leykauf, flying Bf 109 F-4 (W.Nr. 7492) “Black 1 + ~”, made another emergency landing, this time due to bad weather, near Krasnogwardeisk. When the Russians started resupplying their troops during the night in the early summer of 1942, using transport aircraft of various types, JG 54 were active in intercepting these flights. On the night of 22-23 June 1942, Leykauf claimed 6 victories in 50 minutes bringing his score to 23. On 26 June 1942, Leykauf was awarded the Ehrenpokal. On 23 June 1942, Leutnant Leykauf received the Deutsches Kreuz in Gold. On 29 September 1942, Leykauf was wounded when his Bf 109 G-2 (W.Nr. 13 613) was hit by anti-aircraft fire and he had to bail out behind the lines. He managed to return to JG 54. 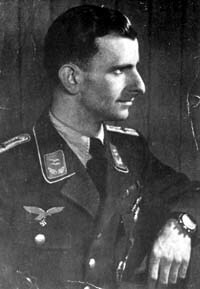 In 12 February 1943, III./JG 54, under the command of Gruppenkommandeur Major Reinhard Seiler and his Adjutant Oberleutnant Erwin Leykauf, transferred to Vendeville near Lille, and placed themselves under the tactical command of JG 26. On 6 April 1943, Leykauf was appointed Staffelkapitän of the new 12./JG 54. On 14 May 1943, during an alarmstart from Wevelghem airfield, a bomb exploded beneath his Bf 109 G-6 (W.Nr. 19 632) “Blue 11”. The blast tossed Leykauf’s aircraft onto a railroad track. Leykauf only suffered shock, but the aircraft was destroyed. Leykauf left 12./JG 54 on 10 July 1943, when 11. and 12. Staffel, JG 54 were renamed 11./ and 12./JG 26. On July 27, 1943, Leykauf arrived at III./JG 54, based at Jesau, to command the new 11./JG 54. On 23 August, he began converting to the Fw 190 fighter. On 25 August 1943, 11./JG 54 moved to Siwerskaja on the Eastern front. Leykauf led IV./JG 54, in an acting capacity, from 10 September 1943 pending the arrival of Hauptmann Rudolf “Rudi” Sinner (39 victories, DK) as Kommandeur on 10 October 1943. IV./JG 54 moved to Trakehnen on 21 September 1944, to serve on Reichsverteidigung duties. Under Gruppenkommandeur, Major Rudolf Klemm (42 victories, RK), Leykauf became the Adjutant of IV. Gruppe on 31 October 1944, before leaving to join II./JG 3 at Alperstedt. Leykauf’s stay at II./JG 3 ended on 26 March 1945 with a transfer to JG 7 at Brandenburg/Briest, where he received training on the Me 262 jet fighter. However, he did not fly any missions before the war ended. After the war, Leykauf studied pharmacy and settled in a small town in Westfalia. He continued his passion for gliding and was also an enthusiastic horserider. Leykauf continued his hobby of filming, which he started during the war. He made many films of the cultural regions of the world after the war.